For our fourth balloon flight, we wanted to use the VOR navigational beacon to try and determine the position of our payload. We needed a) good omnidirectional coverage, b) horizontal polarization, and, of course c) extra lightweight construction. 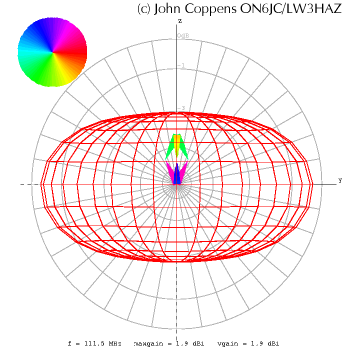 Using a simulation program (nec2) I tried several combinations, like crossed dipoles, fed at 90 phase difference, but most of these, without an extra groundplane, did not give a nearly optimum radiation pattern. 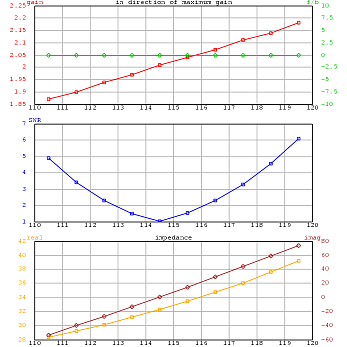 The crossed dipole configuration had very poor performance at the horizon, where sensitivity was important. Two square loops (probably two circular loops give the same result) were much better, and the slight phase difference between the lower half and the upper part caused a very small preference downwards. If the squares are then elongated vertically, things get even better. The radiation pattern at 60 degree angle gave a 1.5 dB gain, while at a slightly smaller angle still (50 degrees) the gain rose to 1.7 dB or so, and the impedance declined to 33 Ohms - symmetrically. This gave me the idea to use a 1:9 balun to 300 Ohms, and then do the 90 degree shift with a 300 twin lead (read lightweight) 1/4 section. Paralleling the two feeds lower the impedance to 150 Ohm, which can easily be obtained from the beacon. The antenna. 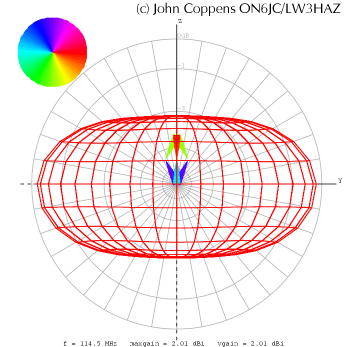 The colors indicate the phase of the currect in the wires (check the circle at the top), and the thickness indicates the current intensity. These are the graphs indicating most interestingly the SWR and the impedance near the center frequency (114.5 MHz). 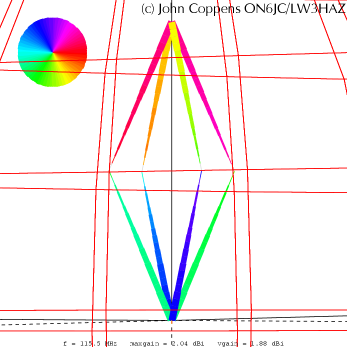 The radiation diagram at the lower band edge, in the X-plane. Note the slight under-the-horizon preference. 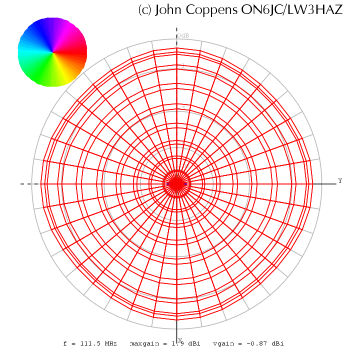 Same frequency, Z-plane, indicating the omnidirectionality of the antenna.